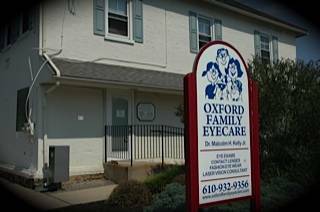 Conveniently located on S 2nd St in Oxford, PA, Oxford Family Eyecare has been serving the Chester County area in Pennsylvania for almost a 100 years! Our office is open 5 days a week, Monday thru Friday. Dr. Malcolm Kelly will discuss with you the health of your eyes, and what the best eyewear soulution or treatment may be. We carry a wide selection of eyeglasses, contact lenses or specialty lens needs. Drop in anytime to browse through our large selection of designer eyeglass frames or sunglasses. We are always welcome new patients with a smiling face!